Have you missed my regular postings? I have really missed writing. First, my PAS (point-and-shoot) camera broke. It was my trusty Canon Powershot A2000 IS that I bought right after my son was born so it's over 6 years old. The bottom hinge broke and I was pretty much scared to use my DSLR that I purchased last year. Well,, as expected, my blog and its readership suffered. I love bringing you the latest news from brands, but especially after my Google+ Chat with Cult Nails, I realized that I want to be a library of nail polish swatches, for you to go through, and the camera shouldn't be what stops me. Back to the polish. From the LVX Summer 2013 collection, today I have Modena, a poppy red creme that is just flat out HOT. I used a base of Cult Nails Get It On, 2 coats of polish and a top of Cult Nails Wicked Fast. I love how opaque and well formulated LVX is. Here it is in the sun and you can see how lovely it is - very red, very awesome. I felt like a powerhouse wearing it. Same story but in the shade. I've had a lot of fun playing with my lightning but with most cremes, the polish doesn't change much. Now if LVX starts making more shimmers... LOL. Hard to make a shimmer when you're following fashion - they don't do a lot of shimmers (or any duochromes... or glitters...). Anyway, back to the polish. 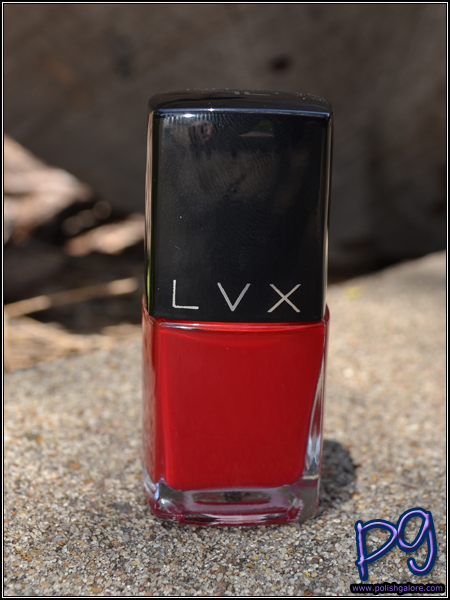 Don't forget that my sale on Gloss48 lasts until this Monday, otherwise you can purchase this beauty at $16 a bottle on the LVX website. 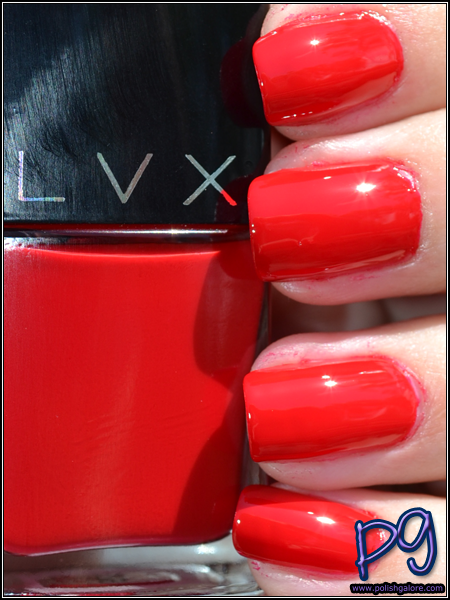 LVX [Website | Facebook | Twitter | YouTube | Instagram] is available on their website for $16 a 17 ml/0.57 oz bottle. It is big 5 free to include Toluene and Camphor, vegan and cruelty free. It really is eye catching!